Yes, I’d like to learn more about Career Key Discovery including a free trial and exclusive offers. Career Key, Inc. will use the information you provide on this form to be in touch with you and to provide insights and information, updates and marketing. Please let us know all the ways you would like to hear from us. With Career Key Discovery, get the right students in the right programs to improve outcomes using the proven science of Holland’s Theory of Career Choice. What if helping your students clarify program and career direction could be simple? 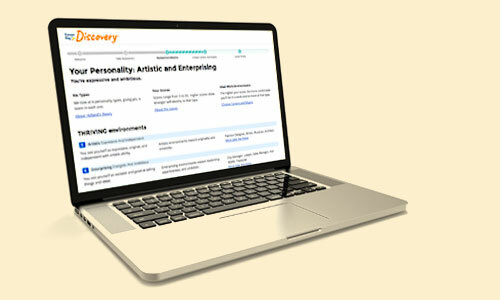 With Career Key, you, your students and applicants will discover which of your college’s majors, environments and careers are the best fit for a student’s unique personality. Results from our brief assessment and proprietary data matching lead students to a major and career selection process that gets them excited and focused. Because students see only majors and programs offered by your college, you’ll both know whether a fit exists. And once a student enrolls, success efforts can expand this collaboration. Students’ success is your success! Know which applicants are the best fit for your specific programs. You focus resources and students feel the fit—your formula for the RIGHT outcomes. 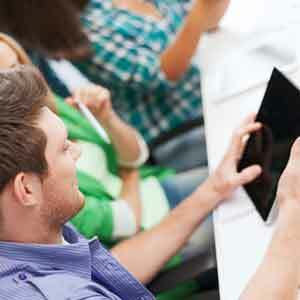 Understand whether a college major fits for any student. Enjoy easier advising and supportive redirection for REAL student success. Connect academics with jobs to engage students. Serve graduates with immediate return on investment. Satisfy employers with best match, high-performing candidates. Yes, I’d like to learn more about Career Key Discovery, including a free trial and exclusive offers. Neumann, G., Olitsky, N., & Robbins, S. (2009) Job congruence, academic achievement, and earnings. Labour Economics, 16, 503–509. Nye, C.D., Su, R., Rounds, J., & Drasgow, F. (2012) Vocational Interests and Performance: A Qualitative Summary of Over 60 Years of Research. Perspectives on Psychological Science, 7, 384–403. Please email support@careerkey.org with your questions or comments. If you are one of our pilot customers, please sign in to access your organization's account. Our web application for Higher Education is a self-service career counseling and academic advising solution. We empower students to clarify career and education direction so you can spend more time helping them achieve their career goals and dreams. Powered by the science of Career Key. © 2016-2018 Career Key Inc., Career Key Discovery™, Career Key is a registered trademark of Career Key, Inc. in the United States and other countries.